With the release of Dan Brown's latest novel The Lost Symbol, Freemasons are once again the subject of curiosity and speculation. Linear descendents of the Knights Templers? Shadow world government? Shock troops for other even more mysterious orders? As with most things, the truth about Freemasonry is much more prosaic. The costumes, secret handshakes, symbols and meeting halls mask a dull reality: Freemasons are more Ralph Kramden's Loyal Order of Racoons than the Illuminati. Jay Kinney is well-placed to know this given that he is a member of the Freemasons. 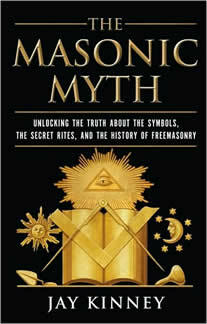 It is that membership and an impressive level of research that informs The Masonic Myth: Unlocking the Truth About the Symbols, the Secret Rites, and the History of Freemasonry, an investigation into The Craft's past and present. He dispels a number of long-lasting myths about the organization – including that it's a single organization – and speculates on its cloudy future. As Kinney chronicles, the origins of Freemasonry have been largely lost to history. It's likely that at some point it actually was an organization made up of working stone masons in Scotland and England before gradually turning into a fraternal order sometime in the 16th century. It gradually spread across the European continent and the United States, spawning thousands of lodges, rival bodies and differing rituals. Though it chiefly attracted society's elites, from the beginning Freemasonry was open to any man with the caveat that they believed in a single deity, meaning Christians, Jews and Muslims of any race were free to join – though this was often more honoured in theory then practice. Members participate in rituals that from the outside can look rather silly but as Kinney points out, each is intended to provoke a member to ponder some profound questions about the world and to promote a set of moral standards. While Kinney doesn't reveal the details of these rituals – which in any case can vary from lodge to lodge – the reader can get the sense that someone committed to Freemasonry would be emotionally affected by them. Kinney also spends time exploring the rich collection of symbols that Freemasonry uses and how they fit into the rituals. Perhaps of most interest to readers is The Masonic Myth's chapters dismissing some of the more fanciful claims about it made by its detractors and allies. Freemasonry is not some secretive order that serves as a shadow government given that it doesn't even have a centralized decision making body to govern itself, argues Kinney. Nor is it connected to the occult despite its use of religious symbols, hardly surprising given that one must accept the notion of a deity simply to be a member. Although there is much to recommend Freemasonry, Kinney points out that membership roles have been declining since the 1950s and the average age of a member is in the 70s. There are a number of reasons for this including the lack of available time for men, the anachronistic nature of Freemasonry and the general decline in the size of people's real world social spheres. The Craft could simply disappear in a generation's time unless lodges are successful in drawing young men away from their video game consoles. Some will likely be disappointed that the "secrets" of Freemasonry that Kinney has revealed aren't of the same calibre as writers like Dan Brown have alleged. Despite that, The Masonic Myth is a fascinating insight into an organization that has survived centuries of fear and favour, arriving in our technological age a relic of the past and yet still capable of offering millions of men today something missing in their lives. Whether Freemasonry has enough to replenish its ranks is in doubt but with proponents like Jay Kinney it at least has a fighting chance.